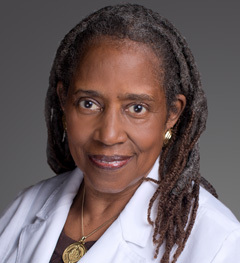 Dr. Claudia Thomas was born an artist. Becoming a physician was a matter of evolution. Growing up in Queens, New York, her artistic talents earned her a place at the prestigious High School of Music and Art upon which the movie and Broadway show Fame is based. Unlike most stereotypical teenage art students, she also had an insatiable appetite for mathematics—the more difficult the problem, the better. When she brought home a 99 percent test score, her father asked her, half-teasing and half-pushing, “What happened to the other point?” So Dr. Thomas learned to score 100s and developed a habit of continually reaching higher and probing deeper. Her fondness for art and math morphed into a fascination with geometry—a natural next step. Dr. Thomas has written an autobiography called God Spare Life that details the major “storms” of her life—from fighting for social justice as an undergraduate at Vassar College to fighting for her life as a kidney cancer survivor and the recipient of two kidney transplants. Despite her busy schedule, she devotes much of her spare time to the community. One of her pet projects involves mentoring and motivating local African American male students to excel academically. A talented speaker, she enjoys giving lectures both in the community and around the world at conferences and panels. Dr. Thomas lives with her husband in Lady Lake, Florida. UNOVA is pleased to provide the communities surrounding The Villages, Lady Lake, Leesburg, Mount Dora, Summerfield, Belleview, Ocala, and Fruitland Park, Florida, with a comprehensive offering of health care services and procedures including, orthopaedics, urgent care, physical therapy, and imaging.